Code-named "The Acorn," the first IBM-PC was developed by a team of 12 engineers at IBM's Boca Raton research and development center. It changed our lives. The company was racing to release the machine ahead of competitors, including Apple and Atari, who were vying to create personal computers that would become as common as household appliances. The engineers were given unprecedented autonomy and just one year to create their product. So rather than develop all of the components and operating system in-house, as Apple had, they decided to forge the product from components made by other companies: a DOS operating system and BASIC programming language developed by Microsoft's Bill Gates; an 8088 processor by Intel; a disk drive by Tandon; power strips by Zenith; circuit board by SCI Systems; and a printer by Epson. Unlike Apple's products, the machine would be sold through outside retailers Sears and Computerland. The machine set the standard for PCs to come. The open architecture model allowed independent manufacturers and individuals to buy components and build their own PCs. The Windows operating system that made Microsoft powerful was based on DOS. Today's Intel processors evolved from that first 8088. And the first machine established the keyboard combination Control-Alt-Delete as a way to restart the operating system without shutting off the machine. A half million models were sold in the first 18 months. Time Magazine named it "Machine of the Year," the first time an object and not a person received the year-end designation. The Boca Raton facility -- built on 550 acres from 1967 to 1970 -- rapidly grew to move than 10,000 employees to meet the demand. But the good times did not last in Boca Raton. 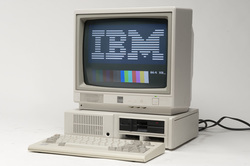 IBM soon moved key operations to other cities in South Florida, North Carolina and Texas, shrinking the Boca workforce to around 1,500 during the 1990s. And while IBM remains an important manufacturer of business-based computer systems, it sold its personal computer business to Lenovo in 2005. It retains a research facility in Boca Raton that employed 600 in 2012, but the majority of its manufacturing and research center has been sold and leased out as a light industrial park. Watch video: University of Dayton honors David Bradley, member of the team that developed the first personal computer at IBM's Boca Raton research and development center.